At a time when the oil barrel is trading at $ 54, and where our leaders are to consider new energy savings, it is regrettable that a number of promising experiments carried out there a long time, n is not pursued, or times subsequently. One such promising experiment took place in the field of railway traction, 1924, ie, there is just 80 years. At that time, we already tried to save ... coal, steam locomotives fuel. The steam locomotives, had a yield of about 10% (when it was not by 7 or 8) and above all, required a heavy maintenance. The rise of the labor force in the years after World War I, therefore, gave the railways to try to use more economic locomotives. Where electric traction was not possible, we thought early in diesel traction; The problem was at the time in the transmission; We did not know, pass the great powers necessary to train traction from the diesel engines to the wheels of the locomotive. In this context, the company Kitson of Leeds developed a machine quite extraordinary, to satisfy the requirements mentioned above; Having a diesel traction machine having a reliable and proven transmission. To do this, the company endowed the locomotive engine of a quite amazing: Still The engine, which had its hours of glory on stationary and marine machines. In a conventional diesel engine, 35% maximum of the heat energy supplied by the combustion of diesel fuel or fuel oil, is converted into mechanical energy. In other words, it is almost 65% of the energy of the engine, which is lost as heat in the exhaust gases. The idea was to recover Still a large part of these calories to heat a boiler and producing steam, which was used in the diesel / steam engine. Kitson society, so built a locomotive, equipped with engines 3 Still. 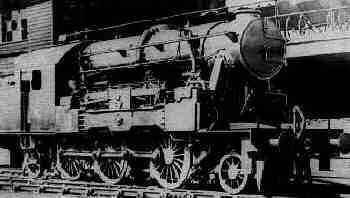 The engines were double effect; Diesel one side and steam from each other, and could-beings driven only by steam. An oil burner allowed the rise in pressure, when starting the machine; to 10 km / h, fuel oil was injected diesel side. Full power is reached after 2 towers, the steam supply was then turned off until the next stop, but need to supplement power in a strong ramp for example. It may seem surprising to cut off the steam supply but this is due to the peculiarity of the railway traction; The maximum force required at startup, then it only takes a lower power to maintain speed. Still in the engine, soliciting the diesel engine part, helped to maintain the temperature, and recover the calories in the boiler playing the role of energy storage. Tractionner vapor, would have caused a drop in temperature of the diesel, which aggravated by steam consumption, would have lowered the pressure in the boiler. 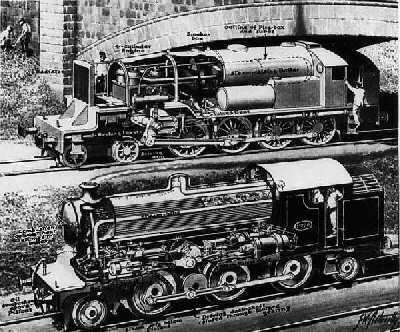 Still Motors, had a yield of nearly 40% more than heat engines of the time, and the locomotive Kitson-Still, consumed on about the fifth in a similar steam engine. But it would have taken heavy investments to optimize, increase his power, and allow the commercialization of this promising prototype. The Kitson company had not the means, and despite the great success that the demonstration knew it went bankrupt, and the Kitson-Still fell into oblivion.